Size does matter… And I love painting big! 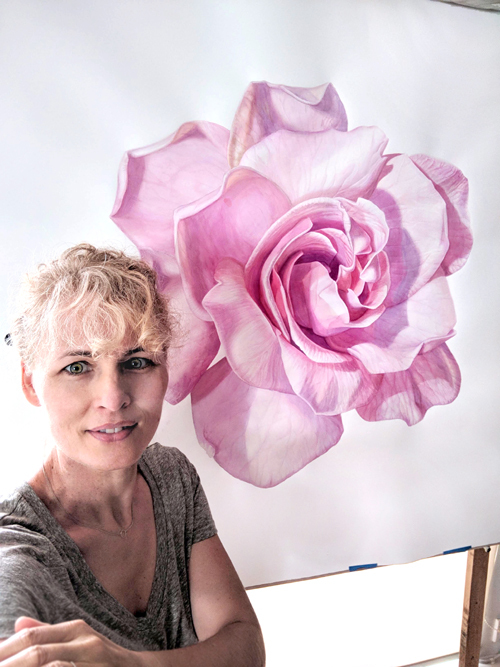 Someone said to me that they had trouble knowing the size of the paintings I posted online… so I have put together a page of pics of me (and sometimes just bits of me) with my paintings so you can get an idea of scale! I don’t always paint big.. but I don’t paint small either. My paintings of a young Silver fern and Crown fern from New Zealand. (it’s on the Gallery page if you want to take a look without me in it!) Called a diptych, is when you make two paintings out of one “theme” so they go together on the wall. These were framed separately (you can see the paper cut down the middle) and turned out really well, if I do say so myself! The client said they were "very peaceful with a sense of movement and growth" which I completely agree with. These were commissioned after an email and then a Skype chat. It was a really simple process. 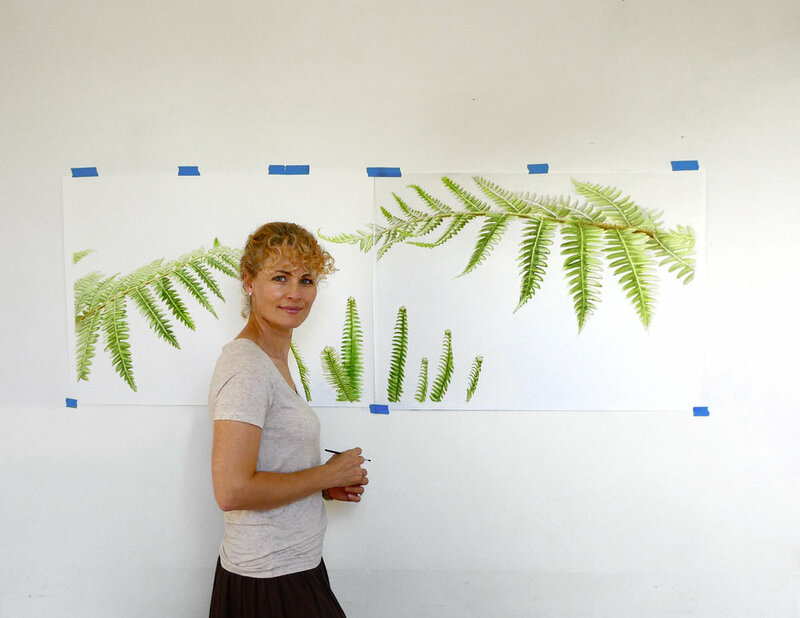 She had two plants in mind, ferns and flax, and then after a chat she decided on the fern and we moved ahead after I gave her a sketch of the layout I thought would be nice. 6 weeks later she had them at her framers in time for her surprise birthday present for her husband. I can’t say I paint lots of leaves. I prefer the call of brightly colored flowers.. but this was a lovely change of pace in the end. Each painting is 24” x 33” without mat or frame. Somehow this seems smaller in the photo than real life. It was on 46” x 46” Italian watercolor paper. A nice big square. Another commission, it took me a while to get going on this one I don’t mind telling you. It gave me some sleepless nights in the beginning and I was worried I wouldn’t be able to pull it together!! The petals are quite “flat” and small in “real life” and so I had to do a lot of developing of shape and form to make it into something I was happy with. If you follow me on Facebook or Instagram you might have seen the odd post of a worried me starting a new painting … it happens every time. I almost feel like I’ve never painted before and I don’t know why, but that is how it goes for me. Wish it wouldn’t, but there you go. The flower was actually white, but Lauren is a pink girl, so we changed it to her fav color that would fit in with her lounge decor. I’ve seen the space that it’s going in. It’s going to look amazing!. A birds eye-view of my “studio space” in our French cottage. Actually it’s just my desk. I don’t have a studio 😥 but that’s the great thing about watercolor and why I chose it as my medium in the first place. It’s portable, small supplies (tiny tubes of paint!) and just a small handful of brushes and you are set. You don’t need a lot of stuff or a lot of space and that’s perfect for me as I travel to and fro from France to Hong Kong. Here is a smaller painting. A gorgeous summer hollyhock that grow all over our village St Cirq Lapopie in France. Pink and pale cream are the most common colors. I can almost feel the hot summer sun coming from the painting! Not that I stay in the village all summer.. there are way tooooo many tourists then! I love spring and autumn, quiet and interesting with spring flowers after a cold winter or leaves turning all the colors of Fall.. my favorite months to visit. New Zealand native Fuchsia “The Tree”. This was one of two fuchsia plants I painted for the New Zealand exhibition for the World Wide Botanical Exhibition held last year. New Zealand has the largest fuchsia in the species.. we also have the smallest too! (the other painting).